He was also known as Nigel Bruce. [S6] G.E. Cokayne; with Vicary Gibbs, H.A. Doubleday, Geoffrey H. White, Duncan Warrand and Lord Howard de Walden, editors, The Complete Peerage of England, Scotland, Ireland, Great Britain and the United Kingdom, Extant, Extinct or Dormant, new ed., 13 volumes in 14 (1910-1959; reprint in 6 volumes, Gloucester, U.K.: Alan Sutton Publishing, 2000), volume III, page 56. Hereinafter cited as The Complete Peerage. 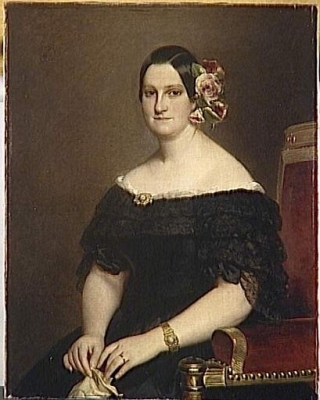 Maria Cristina di Borbone, Principessa delle Due Sicilie was born on 27 April 1806 at PorticiG. She was the daughter of Francesco I di Borbone, Re delle Due Sicilie and Maria Isabel de Borbón, Infanta de España.2 She married, firstly, Fernando VII, Rey de España, son of Carlos IV, Rey de España and Maria Luisa di Borbone, Principessa di Parma, on 11 December 1829. She married, secondly, Fernando Muñoz y Sanchez, Duque de Rianzaro on 28 December 1833 at Madrid, SpainG. She died on 22 August 1878 at age 72 at Le Havre, FranceG. She was a member of the House of Bourbon. 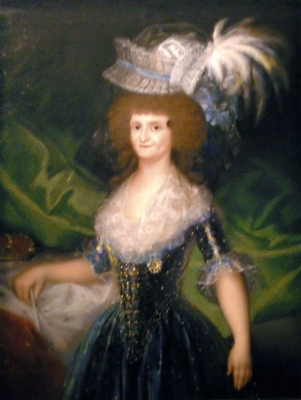 She gained the title of Principessa Maria Cristina delle Due Sicilie. Maria Antonietta di Borbone, Principessa delle Due Sicilie was born on 14 December 1784. She was the daughter of Ferdinando I di Borbone, Re delle Due Sicilie and Marie Caroline Erzherzogin von Österreich.1 She married Fernando VII, Rey de España, son of Carlos IV, Rey de España and Maria Luisa di Borbone, Principessa di Parma, on 6 October 1802 at Barcelona, SpainG. She died on 21 May 1806 at age 21. Maria Isabel de Bragança, Infanta de Portugal was born on 19 May 1797 at QueluzG. She was the daughter of Dom João VI de Bragança, Rei de Portugal e Brasil and Carlota Joaquina de Borbón, Infanta de España.2 She married Fernando VII, Rey de España, son of Carlos IV, Rey de España and Maria Luisa di Borbone, Principessa di Parma, on 29 September 1816 at Madrid, SpainG. She died on 26 December 1818 at age 21 at Madrid, SpainG. Maria Elisabeth Maximiliana Prinzessin von Sachsen was born on 4 February 1830. She was the daughter of Johann I König von Sachsen and Amalie Auguste Prinzessin von Bayern.1 She married, firstly, Ferdinando Maria di Savoia-Carignano, Re di Sicilia, son of Carlo Alberto di Savoia-Carignano, Re di Sardegna and Maria Theresia Erzherzogin von Österreich, on 22 April 1850. She married, secondly, Niccolo Guiseppe Rapallo, Marchese Rapallo on 4 October 1856 at Aglie, ItalyG. She died on 14 August 1912 at age 82 at StresaG. He succeeded as the Rey Carlos IV de España in 1788.3 He abdicated as King of Spain in 1808. 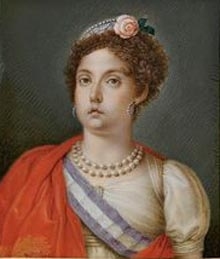 She gained the title of Principessa Maria Louisa di Parma. 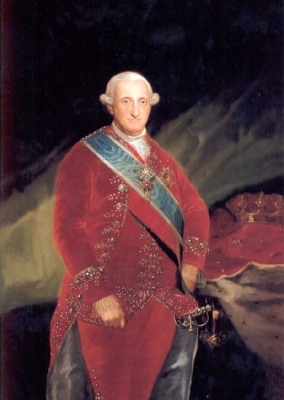 Carlos III de Borbón, Rey de España was born on 20 January 1716 at Madrid, SpainG. 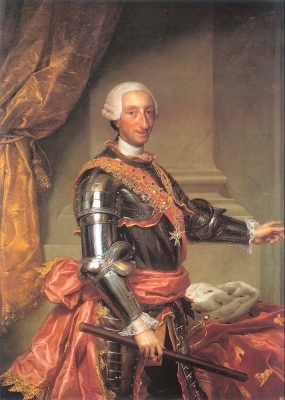 He was the son of Felipe V de Borbón, Rey de España and Isabella Elizabeth Farnese. He married Marie Amalie Prinzessin von Sachsen, daughter of Friedrich August II von Sachsen, King of Poland and Maria Josepha Erzherzogin von Österreich, on 19 June 1738 at Dresden, Sachsen, GermanyG. He died on 14 December 1788 at age 72 at Madrid, SpainG. Marie Amalie Prinzessin von Sachsen was born on 24 November 1724 at Dresden, Sachsen, GermanyG.1 She was the daughter of Friedrich August II von Sachsen, King of Poland and Maria Josepha Erzherzogin von Österreich.1 She married Carlos III de Borbón, Rey de España, son of Felipe V de Borbón, Rey de España and Isabella Elizabeth Farnese, on 19 June 1738 at Dresden, Sachsen, GermanyG. She died on 27 September 1760 at age 35 at Buen RetiroG.